These are the words recorded on the plaque in the entrance of Temple Israel at the official opening on 23rd August, 1936. That was 78 years ago, and the Mother Synagogue of Progressive Judaism in South Africa still stands proud, as a place of Jewish culture and religion in Hillbrow, Johannesburg. Many of the Jews still remain and live in the area are old, infirm, lonely and impoverished people, living in Hillbrow, Berea, Parktown and Yeoville. These Jews still look to Temple Israel as their spiritual home. It is essential that we keep our doors open for these Jewish people who have nowhere else to go. All services are maintained, Shabbat Friday night and Saturday morning and all religious Festivals. Temple Israel has also extended its influence to become a place of outreach to the previously disadvantaged – uplifting the neighbouring street people who are being taught literacy and other skills. Temple Israel has meant so much to so many of us – wonderful memories of family gatherings for High Holy Days, Simchas, Bar/Bat Mitzvahs – Blessings, Honours and Worship! We owe it to our Religious Jewish Heritage – and its founder Rabbi M C Weiler – to renew our Temple to its past glorious being – a place of importance of the spiritual element in human and Jewish Life. We have a substantial library and historical memorabilia which we plan to display, and also offer facilities for anyone who is interested, to come and learn more about our history or make use of the library. Our longer term goal is to retain a Rabbi who can handle all rabbinical matters of the Jews in the area and also be involved in the general upliftment of the local community. We would appreciate any assistance that will help towards our dream of keeping the birthplace of South African Reform Judaism alive and to be of service to all Jewish People in need. 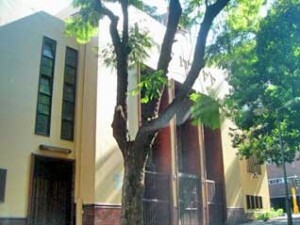 Temple Israel was built in 1936 in Paul Nel Street in Hillbrow when the suburb still consisted of houses and the Jewish community in the suburb consisted of about 800 worshippers, a few of whom still live there and in neighbouring Berea and Yeoville. Now the size of the congregation is around 30 faithfuls, rising to about 300 on high holy days. But this doesn’t mean the shul isn’t close to a lot of people’s hearts. Last year it celebrated its 70th anniversary and a booklet was produced with contributions from many old timers. They all write of their fond memories of Temple Israel: being married in the shul, having their barmitzvahs or batmitzvahs in the shul, attending Hebrew lessons or lessons in Judaism. The synagogue is the mother shul of the Johannesburg Jewish Reform Congregation. Its building can be traced back to a visit in 1929 by Professor Abraham Zvi Idelsohn, who visited his family in Johannesburg from Cincinnati in the US. He lectured on Jewish music and the principles of Progressive Judaism. Idelsohn encouraged his brother, Jerry, to establish a Progressive Jewish group in the city. After conducting services in homes in 1930, in June 1931 the South African Jewish Religious Union for Liberal Judaism was established. Jerry contacted Moses Cyrus Weiler, then a student at the Hebrew Union College under Idelsohn. Once he was ordained, in August 1933, Rabbi Weiler came to Joburg and a progressive congregation was assembled. Their first service was held in the Freemasons’ Hall in Clarendon Place, on the edge of Hillbrow. At the end of 1933 the site, three-quarters of an acre in size, was bought and three years later the shul was officially opened. It’s an impressive, imposing building in a quiet, clean, jacaranda-lined street. It rises up from the pavement in a fortress-like manner, some four storeys into the sky, built in the Art Deco style with its long, vertical lines. Inside wood panelling and parquet floors greet you in the foyer. Stepping into the synagogue itself your eye is drawn to the striking bimah or altar, with its twin gold columns and menorah-shapes going up the wall, almost hiding a choir loft. A three-sided gallery runs around the main seating area, accommodating not just women, as in an orthodox shul, but both sexes. The architect was Herman Kallenbach (with partners Kennedy and Furner), who also designed several other striking places of worship around the city: the Greek Orthodox Church in Wolmarans Street and the Dutch Reformed Church in Fairview. The site houses a pre-school for local children. It falls under the Ma Afrika Tikkun programme, an initiative started to help the disadvantaged. One of its current programmes is to run a soccer team for street children. The shul has another outreach project – the MC Weiler School in Alexandra. It was started in 1944 by the women of Temple Israel, in the belief that being a Jew involved not only helping fellow Jews but also those around you who needed help. Despite the deteriorating conditions of Hillbrow, the community continues undaunted. Reeva Foreman, the chairman of the temple, wrote in the 70th anniversary publication: “Temple Israel has operated in a difficult environment – one which has not improved over the last year. Temple Israel is a Mitzvah synagogue, meaning “good deeds”, reaching out to both Jew and non-Jew alike. The Jewish reform movement traces its roots to the Age of Enlightenment in the eighteenth century. During this time Europe became more tolerant of Jews who, until then, had been confined to ghettos. Jews were able to move out of the ghettos and, although there were still restrictions on them, they lived as close as possible to the normal life of their fellow Europeans. It established itself in South Africa when Eastern Europeans migrated to the country in the 1930s, fleeing the pogroms in their homelands. The reform movement is less strict about traditional Jewish beliefs; for example, it allows equality for women, is less fussy about kosher food and is tolerant of gay rights. In 1983 the ANC’s armed wing, Umkhonto we Sizwe, planted a bomb outside the synagogue in an attempt to prevent the then president, Marais Viljoen, from attending the temple’s 50th anniversary. No one was injured, however, and Viljoen attended the celebration. In Joburg there are only three reform congregations: Temple Israel, Temple Emmanuel in Oxford Road, and Temple Bet David in Sandton. There are nine congregations in South Africa which trace their roots back to Temple Israel. In recent decades many reform Jews have left South Africa. The City is proposing that the temple becomes a provincial heritage site.